be used to visualize a scalar field? Some 20 years ago I have made a system enabling me to directly visualize in real time the Kirlian Aura. The set-up was quite simple and was mainly built as a curiosity item during my introduction into the high voltage research field. At that time I was unaware of the vector potential A and Poynting vector and consequently incapable of explaining what I was witnessing. The goal of this paper is to bring forward some information on the phenomenon and share how this viewer can be built so that more experimenting can be accomplished. This electrophotography process has been discovered in 1939 by the Kirlian couple then living in Krasnodar ( Croatia ) near the Black Sea. Seymon Kirlian first noticed the pale violet halo around objects while working near a high frequency generator used in electrotherapy. Following his intuitions, he and his wife then started investigating on this effect in their small apartment up to the point when they succeeded on taking color photographs of animated and unanimated objects. The set-up to make a Kirlian photograph is actually quite simple. The photographic film is exposed for a certain amount of time, while still packed in his plastic envelope, to a high frequency high voltage field applied to two electric plates (one if the subject is grounded) influencing the subject and the film. Stunning color photograph can be made by this method although they elude all explanation relative to the color interpretation. What is most intriguing, is the fact that the images seems to have a direct relationship with dynamic systems. It has been demonstrated for example that the acupuncture points are definitely identifiable by this process ( counter verified with a Ohm meter ) and that a picture varied with the emotional and physical health of the subject. In the above pictures, you can see a freshly picked rose petal revealing with all of its splendor its living energy field. The most stunning observation is made when a part of the petal is cut (right); a ghost aura is quite apparent even so the physical part is missing. Another demonstration on the abilities of this process can be found when using a slightly modified variation. The process used in this case calls upon the use of electrosensitive liquid crystals to map the voltage gradients around a drop of blood. The specimen is electrified by 40 kV provided by a Tesla coil, one electrode isolated under the drop and the other touching it. The strength of the field through the liquid crystals reflects the visible color, red corresponding to about 50 v, yellow to 90 v, green to 120 v and blue to more than 150 v.
The above blood sample pictures are from 4 different individuals where the two first blood samples comes from patients which are known to be healthy, while the third one comes from a osteosarcoma patient and the last one from a leukemia patient. Furthermore, the technique has been tried in a imaginative and different approach by Mr. Chuck Shramek. Using a Tesla coil connected to a conductive plate on which he was standing, he managed to take remarkable pictures of himself with a ordinary camera, while standing still for about 15 seconds. He then superposed his real body photo with his aura photo. This branch of scientific imaging is still in its infancy and many more amazing discoveries are yet to be done. One item seems to standout from the 3 preceding examples : A field of some sort emanates from a dynamic system and I would tend to speculate that its nature is of a Scalar type. When the electric or magnetic field from the high voltage system crosses this Scalar field, the component normally missing for it to be visible is linked and consequently the Scalar field can now be seen ( becomes electromagnetic). The viewer can be built with some common materials. The system is constituted by two major parts, the viewer and the high voltage source. The latter was easily achievable using common practice and any AC or DC source of at least 25 kV is adequate. In my first test I have used a old car ignition coil with a square wave generator. 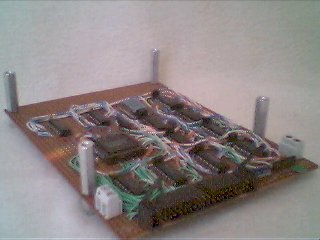 Later I have designed a variable frequency sine wave generator using an electronic circuit based around the AD7008AP20 chip. This circuit is intented to be connected to the PC parallel port for control and human interface. A driver circuit ( not shown ) is then used to interface the low power signal provided by the oscillator circuit to the primary of the amplifying coil. The amplifying coil is a hand wound coil constituted by 30,000 turns of AWG 40 wire as the secondary and 54 turns of AWG 28 wire as the primary. The whole thing is then placed in a mylar isolated paint can that acts as a faraday cage on which a car ignition cap is used as the exterior connector. 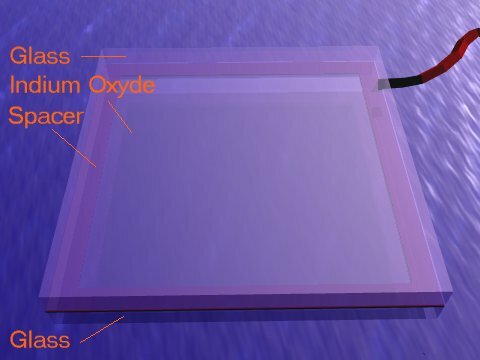 The viewer is built in the shape of a transparent capacitor. In order to get transparent metal electrodes, I have used a Indium Oxide covered glass such as the ones used in liquid crystal displays ( LCD ). This glass comes at various thickness and can be purchased from specialized makers who are using a sputtering technique. Two glasses are made to face each other leaving a very little air space between them. The thickness of the air space must be very small and I found that using the thickness of a Schotch Tape ( or a sheet of paper ) seemed optimal. The high voltage electrode by common sense should be facing the observer and the ground electrode should be on the specimen side ( your finger ! ). I have also found that the ground electrode could be alleviated, keeping just the isolating glass, if the specimen to study is itself grounded. 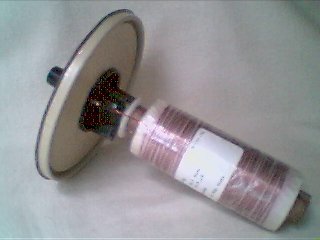 A well isolated high voltage electric wire such as the one commonly used with the ignition coil is suited to carry safely the excitation voltage between the source and the viewer and can be connected permanently with the Indium Oxide layer using a silver filled conductive epoxy (conductive glue ). The viewer must be used in total darkness and the image appears as a pale violet light. This fact may corroborate the reports on peoples with a sensitive view who are capable on occasions to see the human or otherwise " Aura ". The possible explanation could be that since we are constantly standing in a high potential field ( the earth electric field ), on days of high tension, the ultraviolet light emanating from the body is more perceptible. Its amazing to see life's expression reveal itself by these undulating flares moving around. Following my observation that most of the appearing image belonged to the violet to near ultraviolet region of the light spectrum, in a subsequent variation of the viewer I have used a quartz glass instead of lime glass ( ordinary window glass ) since the former lets the ultraviolet light pass through more easily. I then found, after several trials, that the image could be further enhanced by using a thin layer of ultraviolet sensible phosphor such as Sodium Salicylate. I have furthermore made the observation that the image is subject to the frequency of the high voltage field as if a phase lock was necessary between the Scalar and the added component in order to see an image. This is to say that the true nature of a diagnostic based on the Kirlian viewer must be done according to the natural frequencies of our body. Then a false color imaging of each frequency range can be superposed one over the other to give a global view of the patient's health. Yet another interesting observation can be done by looking at a magnet with the viewer where one can see a field which is quite noticeable around its equator ( Vector Potential A ). While manipulating a couple of magnets, one can also witness the interactions between them. The same observations has also been made in the past ( 1973 ) by two researchers from the University of Birmingham, D.R. Milner and E.F. Smart. A word of caution : If you intend to built the viewer, remember that you are manipulating dangerous high voltage and to also use the viewer in a well ventilated area since it generates ozone which is irritating for the lungs.